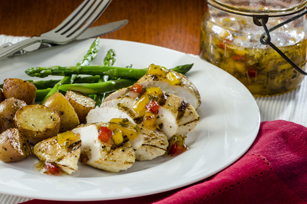 Our Light Peach Salsa is the perfect condiment. Full of summer-fresh peaches, onions, peppers and seasonings, this chunky salsa is best served with grilled meat or fish. Peel, pit and finely chop peaches; place in large saucepan. Add next 8 ingredients; mix well. Mix 1/4 cup sugar and pectin; stir into peach mixture until blended. Bring to boil on high heat, stirring constantly. Stir in remaining sugar. Bring to full rolling boil; cook 1 min., stirring constantly. Remove from heat. Stir 5 min. to prevent ingredients from floating to top, skimming foam as necessary. Pour immediately into warm sterilized jars, filling to within 1/4 inch of rims. Seal while hot with sterilized two-piece lids with new centres. Let stand at room temperature until set. To get exact level cup measures of granulated sugar, spoon sugar into dry metal or plastic measuring cup, then level by scraping excess sugar from top of cup with a straight-edged knife. Measure total amount of sugar into separate bowl before using as directed. Serve brushed over grilled chicken or pork. This delicious salsa can be part of a healthy eating plan.